Nier: Automata originally launched on PS4 and PC in 2017, before joining Xbox One with the Become as Gods Edition in 2018 which included additional content. Now things have come full circle in 2019 with the Game of the YoRHa Edition, bringing that extra content (plus some exclusive bonuses) to PS4 and PC. Whatever platform you're playing on, the premise remains the same - you need to guide your android characters through deserts, abandoned factories and unsettlingly cheerful amusement parks in order to make Earth safe for humanity. Along the way you'll have to deal with collapsing environments, killer robots, and all sorts of other challenges, which is why we've put together these Nier: Automata tips to help you to progress. Death is all but guaranteed, but this guide should at least make it a bit less frequent. The hardest section of the game may be it's beginning. You're thrown into a series of aerial fights, have to fly through narrow corridors that will damage you if you bump them, learn the ropes of melee combat, fight your first boss, battle waves of lesser enemies, and then fight a multi-phase boss that can only be defeated through using multiple styles of combat and obeying special prompts. All of this comes before the games first access point, which means if you die you'll have to play through roughly 40 minutes of content again. After that you'll have a grasp of most of the mechanics needed, or at least figured out how to lower the difficulty. You'll also quickly get access to shops that will let you customise your fighting style and buy way more of the vital healing items than the allotment you start the game with. If you can survive until then, you'll be able to handle the rest of Nier: Automata's challenges. As an android, your character's skills come in the form of plug-in chips that can be reset throughout the game. Each chip takes up a certain amount of space, including the ones that mark your mission objectives on a map and tell you things you need to know in combat - like when your cooldowns are ready, your current health and how much damage you're dealing. More powerful chips that increase critical hit chance or let you heal when you attack take up more space, so you'll want to pump much of your gold into expanding your capacity. Even then it's a good idea to figure out what you can live without. Take advantage of the game's multiple options for saved chip configurations by creating an exploration set that emphasizes move speed and map tools and then switching to a fighting-focused build when you enter combat. When your android is low on health, the visuals become monochromatic with a bit of pixilation at the corners to indicate that their systems are failing. It's a cool effect, adding tension to the scene and a sense of urgency to pop a restorative item. Unfortunately it also turns off a key visual cue: the red lights around machines that are about to blast you with ranged weapons. That can quickly make an already bad scenario much worse, so you'll want to invest in a chip that automatically heals your character or learn to pick up on the animation that enemies use when powering up their lasers so you can avoid the attack and find a moment to heal. You can read stories relating to your weapons at any time from the Intel section of the menu, but learning what materials you'll need to upgrade them requires you to be at the right shop. That's also true when it comes to improving your incredibly important Pod companion robot. Take note of what you need so that when you come across someone selling materials, you know what to buy without having to double back. Mapping out the next few upgrades will also keep you from worrying if you have to sell from your items for quick cash. While most of Nier: Automata consists of on-the-ground combat, there are significant portions where you'll be flying a spaceship trying to blow up your opponents before their endless waves of gunfire shoot you down. These sections also come up when you least expect them. The game opens with you in the sky, before you get to spend some time as a mech deflecting enemy fire with a sword. A bullet hell mini-game is also how your android gets into hacking battles with other machines. That makes for a pretty jarring transition when one moment you're fighting a robotic opera singer and her enslaved android army with your sword, and then you have to shoot down a specific orb to get back into the fray. You'll want to get good at it since injuries in the hacking game will be carried over to your androids. 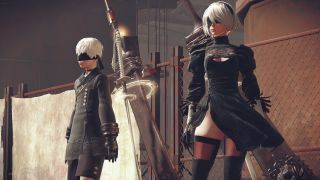 You don't have to be connected online to play Nier: Automata, but doing so will make the game a little bit easier and more fun. As with Dark Souls, death in Nier: Automata is a social affair. The game is littered with the corpses of fallen players, and you can pray over them to get a bit of gold and a buff based on what plug-in chips they had equipped when they died. You can also attempt to repair the android body and get a temporary ally. Likewise, when you die you'll have your memories uploaded in a new body that pops out of the nearest access point (ie save point), but you'll need to get back to your corpse to recover your own plug-in chips. You get to keep your other gear and the game is generous with plug-in drops, but duplicate chips can be fused into more powerful versions so it's usually worth the trek back. Corpses each come with a message about their fate, though don't expect them to be particularly useful. They're chosen randomly or preset by the player from a list of options. The infuriating invisible walls that plague Nier: Automata might dissuade you from poking your head into buildings and trying to climb and jump around ruins, but you'll need to really explore the world to find powerful items, side quests, and even to continue the main plot. Think three dimensionally to get around seemingly impassable areas to your next objective, whether that involves shimmying down a ladder into the sewers or hopping around the cars of a stopped ride to get to a ledge. Elevation is also extremely useful in combat, letting you avoid sprays of ranged attacks and forcing some bosses to waste time adjusting themselves so they can target you again. The ability to double jump means you can stay in the air a surprisingly long time during a fight, which really helps when the ground is covered by spinning lasers. In classic action RPG fashion, much of Nier: Automata's boss fights involve finding the right moment to attack. You'll need to get good at shooting on the run and evading devastating (if highly telegraphed) attacks while waiting for your moment to unleash your own heavy strikes. But the game keeps you on your toes by changing things up. Bosses can spawn swarms of fast attacking monsters you need to burn down quickly, lest they distract you from the main objective. Then there's Adam, the incredibly fast-learning android who levels up as you fight. That's when it's good to alter your plug-in chip configuration and your companion android's tactics in order to unleash the most aggressive offensive possible. In between intense fights and deep conversations about the nature of life and the fate of humanity, it's nice to chill out and appreciate some of the game's lighter touches. Pick up some animal bait and ride a moose or wild boar while taking in the beautifully rendered scenery. Take up fishing, using your companion robot as a bobber who will bring back weird catches, including machine fish and pipes that can be used as weapons. Along with being necessary to unlock all of the game's collectibles, some of those items can be sold for big money, so use your downtime wisely to increase your assets. Want more Nier: Automata? Then check out how a robot-powered action game became a powerful study of human frailty.